Being a leader can be hard. The statistics show that a majority of the workforce feels disengaged. People are not going the extra mile organizations need them to. Sandra McDowell, public speaker, workshop facilitator and author is teaching aspiring and established leaders that leadership can be very simple through the field of neuroleadership. 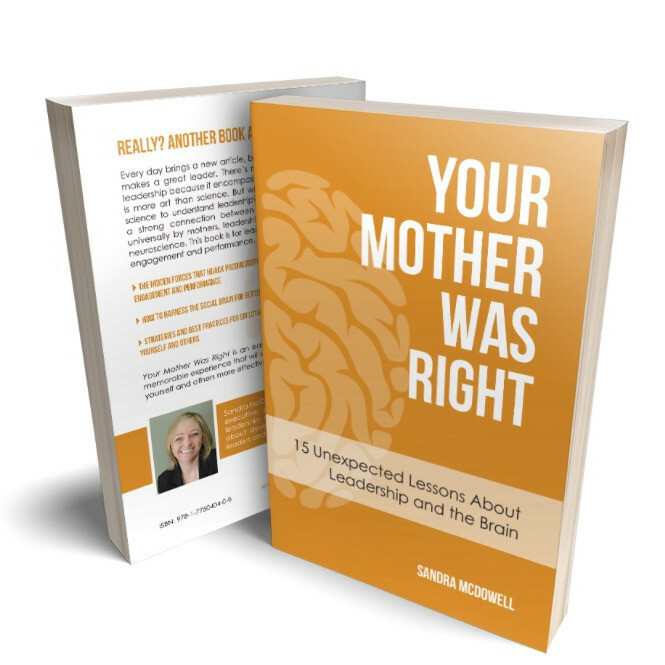 In this podcast episode, Sandra talks about her public speaking career, dives into her new book ‘Your Mother Was Right: 15 Unexpected Lessons About Neuroleadership and the Brain‘, and shares tips on how we can all become better leaders. I hope Sandra inspires you to take on her simple leadership lessons. She certainly inspired me. Have a listen, won’t you? Sandra is a sought-after speaker and facilitator on the topic of leading with the brain in mind. She has spoken for groups of all size, from teams of 5 people to international conferences with 2500 attendees. Sandra has a wealth of experience as a keynote speaker, webinar speaker, and workshop facilitator. This year Sandra will be speaking on the topics of NeuroLeadership and Mindfulness at a number of conferences nationally and internationally. Attendees of her sessions will learn how distractions can negatively impact their performance as leaders, and how self-awareness and focus can increase effectiveness. Attendees gain an increased understanding of how to harness the brain for improved productivity, communication, and overall well-being. Sandra takes complicated topics, such as leadership, neuroleadership, and mindfulness, and explains them in a relatable way that supports leaders to lead themselves and others more effectively with the brain in mind.